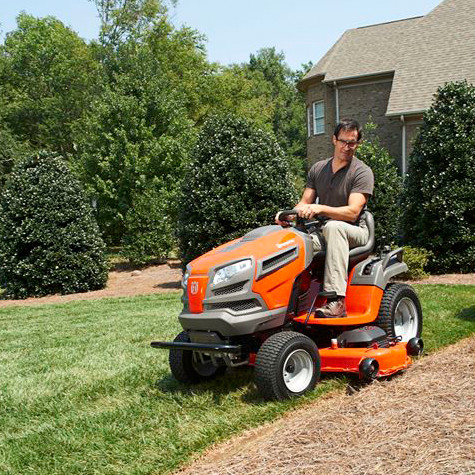 What are the differences between Ride-On Front Mowers and Garden Tractors? Are you unsure whether you need a ride-on mower or garden tractor for your large garden, land or park area? In our buying guide we point out a few differences between the two so you can choose the right machine. When you have a larger garden or a large area of land to maintain and look after, you need an effective grass cutting machine. Ride-on mowers (also known as front mowers) and garden tractors are both designed for taking care of extensive grassy areas and gardens. However, they do feature some key differences, which are explained below. As the name suggests, ride-on front mowers have a front-mounted cutting deck, which is particularly useful when the land that you need to maintain has a lot of obstacles to negotiation. The position and low height of the cutting deck on ride-on mowers makes it easy to mow the grass underneath benches, tables, bushes, tree stumps, playground equipment and other low objects. Also, the high, central seat position offers the driver a clear view of the work area along with exceptional stability due to its low centre of gravity. A selection of models feature all-wheel drive (AWD) and are therefore a popular choice for commercial and professional use in public parks and very large gardens. But, they are just as practical for maintaining large domestic gardens and private land. As the wheels on ride-on lawn mowers can swing underneath the machine, they also have outstanding steering and maneuverability, with an exceptionally small turning circle that can easily cut around the narrowest trees, posts and ponds. Some ride-on lawnmowers also feature mulching technology which helps to improve the condition of your lawn as it cuts. Mulching works by cutting the grass and throwing it back up into the cutting deck, so that the grass can fall onto the blades for a second time. This cuts the grass clippings so small that they break down and return their nutrients to the soil, acting as a natural fertiliser. 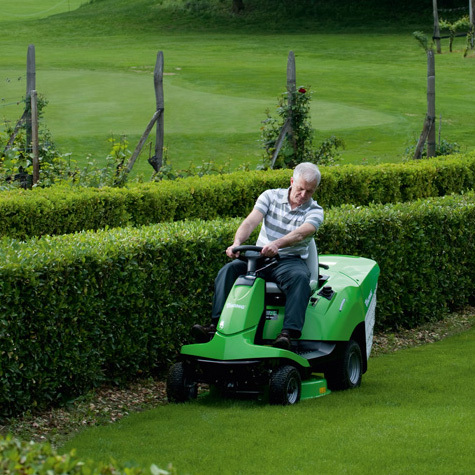 If a versatile garden maintenance machine is what you're looking for, garden tractors are the ideal solution. 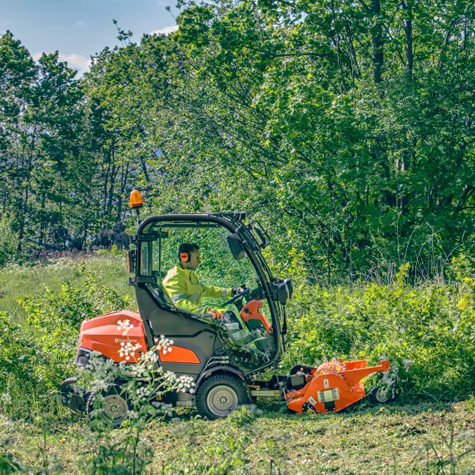 As well as cutting grass, our domestic garden tractors can be used for several other purposes including; sweeping leaves, moving snow, spreading fertiliser, or even as a trailer, thanks to the wide range of attachments available. A key difference between a tractor and a ride-on mower is the position of the cutting blades, which on garden tractors are located at the centre of the machine. This makes them very effective for cutting large gardens or areas of open land and parks and around wider objects like trees and bushes. 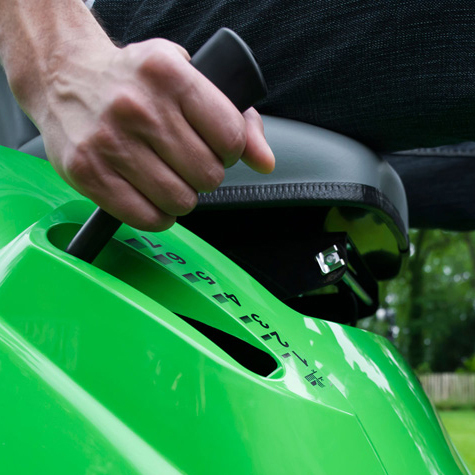 A downside compared to ride-on mowers is that they are unable to cut underneath low objects such as benches, as the cutting deck cannot reach. This also creates a larger turning circle than that of a ride-on. 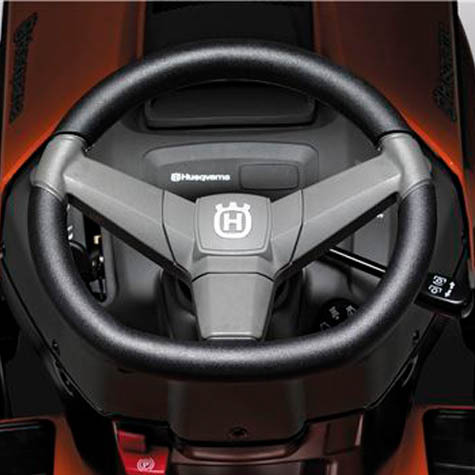 However, some garden tractors are equipped with unique U-Cut steering technology. This reduces its turning circle dramatically and allows unprecedented tight turning and optimised manoeuvrability compared to other garden tractors on the market. 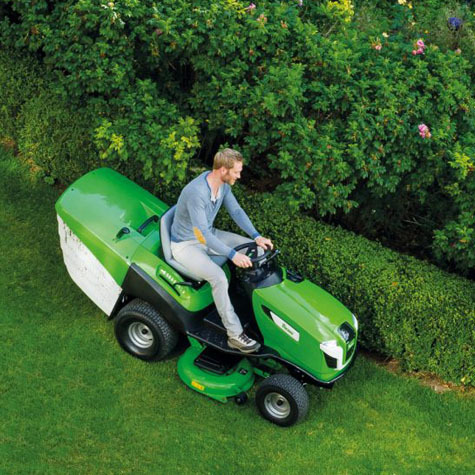 With garden tractors you also have the choice of three grass cutting systems: collecting, mulching or side ejection. 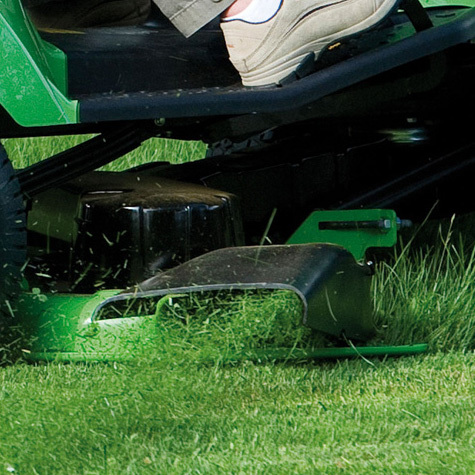 These options allow you to deal with grass clippings in the way to match your preferences. So you can choose a garden tractor that's perfectly suited to your garden maintenance needs, no matter how broad they may be. Husqvarna riders reach places you never thought possible, helping you work in narrow and tight spaces, on slopes and across all types of terrain. But you’ll find there’s more to a Husqvarna ride-on than just that. Our range of machines are specifically designed to offer different working solutions for different needs. 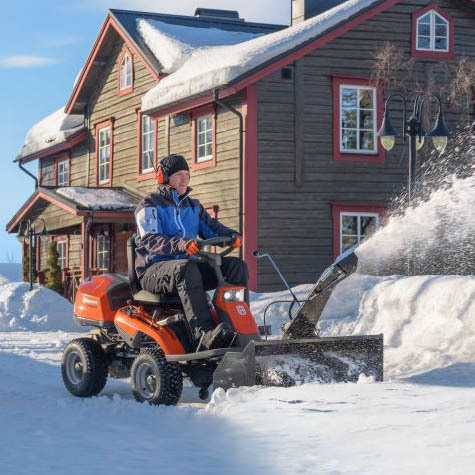 With different mowing options and a wide range of attachments for everything from mowing to snow throwing, they deliver a new level of performance. Articulated steering, unsurpassed manoeuvrability and front-mounted cutting deck, the combination of control, comfort and efficiency the Rider makes mowing and other tasks around your property and land all year round fun and enjoyable. It’s hard to find places where these machines aren’t able to reach. With the front-mounted cutting deck, you have total control over the working area, allowing you to reach under bushes and benches and get closer to fences and walls. The unparalleled manoeuvrability of our unique articulated steering makes our Riders extremely easy to handle. You work more efficiently, and get perfect results faster, with less effort and in addition, a wide range of accessories helps you complete other garden tasks all year round. With or without All-Wheel Drive – the decision is yours. The articulated steering together with the hydrostatic transmission provides a smooth operation, so the job in hand can be done with greater precision. With our Combi cutting decks you have two cutting techniques to choose from. Rear ejection or BioClip®. Taller, wilder grass and coarser types of grass should be cut with a rear ejection cutting deck that can manage large amounts of grass. The BioClip® method is especially suitable for well-maintained lawns that are mowed often. The finely cut clippings return to the lawn as a natural fertiliser. If your lawn can be slippery or is steep in places, or if you intend to use the Rider all year round, AWD (All-Wheel Drive) is a great investment. A range of accessories like a sweeper to collect grass, leaves and debris. Moss rake, scarifier, spreader and trailer for lawn preparation and a snow blade, a snow blower or a front-mounted brush to clear entrances and paths year around. The articulated steering gives first-class manoeuvrability and facilitates driving around obstacles such as trees, bushes, flower beds and benches. Front-mounted cutting deck gives an excellent view of the working area, allowing you to trim edges and reach into corners and under bushes with ease. Safety, stability and traction on both flat ground and hillsides. The rider’s low centre of gravity contributes to safe excellent traction and user comfort. Our Combi cutting decks feature the superior BioClip® mulching technology, which refines grass clippings into natural fertiliser, providing a rich, green and healthy lawn. Husqvarna Riders are easy and fun to drive with precise steering, pedal-operated hydrostatic transmissions and intuitive controls. The large amount of attachments make a Husqvarna Rider usable all year round for a wide range of tasks. 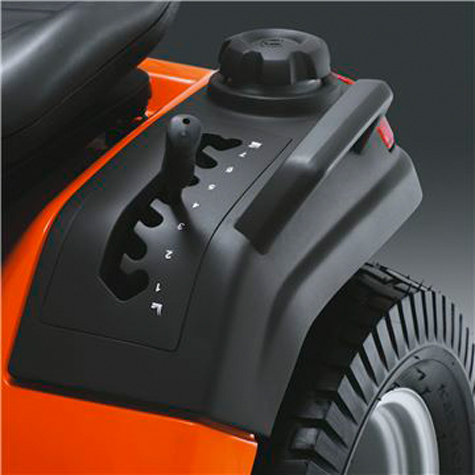 All service points on a Husqvarna Rider are easily accessible, including the underside of the tiltable cutting deck. 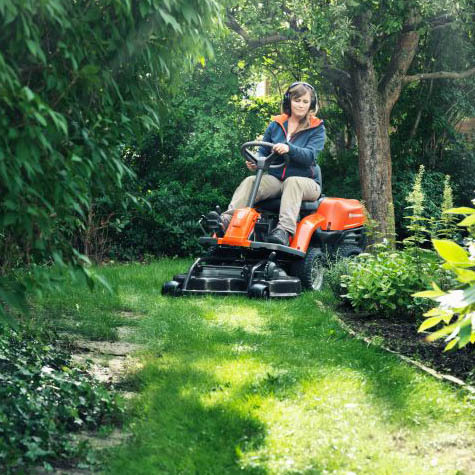 Husqvarna BioClip® is a great way to take care of grass clippings and fallen leaves. With BioClip® the clippings and leaves are repeatedly circulated through the blades and cut into small pieces, before dropping them back on to the lawn. These cuttings are so small that they pass through the grass, down to the soil, working as a natural fertiliser. It’s a convenient and environmentally friendly way to get a healthy, lush green lawn. With cutting widths ranging from 85 to 122cm you will easily find a Husqvarna Rider that suits your land or garden, whether it is large and wides or narrow and complex with lots of obstacles. Their excellent manoeuvrability and the superb accessibility offered by the front-mounted cutting decks make these ride-on mowers perform in a class of their own. Adapt your Husqvarna Rider to all seasons and many different tasks with the extensive range of attachments. Brroms, trailers, spreaders, snow throwers, moss rakes and more to make your machine totally versatile – ready to take on job after job. A wide range of attachments and choice of several cutting methods give our garden tractors excellent versatility. Ideal for efficient lawn care and various tasks around your land and garden. Choose between three different cutting systems for lawn care then fit a trailer, spreader, snow blade and more for greater versatility. Frequently mowed lawns can be fertilised the natural way with the BioClip® function, which is available as standard on the larger TC models. It’s also available as an accessory for the 100 series TC models and all TS models. In addition, collectors are available as an accessory for the TS models, while the TC models can be converted to rear ejection by an accessory kit. So you really can’t go wrong as long as you choose Husqvarna! If you mostly cut large areas with long-grown grass, a tractor with side ejection (TS models) is the most suitable for you. If you prefer a tidy cutting result and want to collect grass clippings, leaves and other debris, we recommend a tractor with integrated collector (TC models). A garden tractor with hydrostatic transmission is much easier to operate than a tractor with manual transmission. With manual transmission you have to stop the tractor every time you change gears. All Husqvarna tractors are supplied with automatic transmissions. The hydrostatic (CVT-TS138) transmission gives you stepless speed adjustment while driving. There are two different hydrostatic transmission solutions. For maximum comfort, choose a tractor with a pedal-operated transmission, where separate pedals control speed and direction for forward and reverse movement. The other option is the lever-operated hydrostat. The lever is on the fender and is easy to access from the driver’s seat. A wide range of attachments adds more value to your tractor investment, making it truly versatile and useful for all year round. 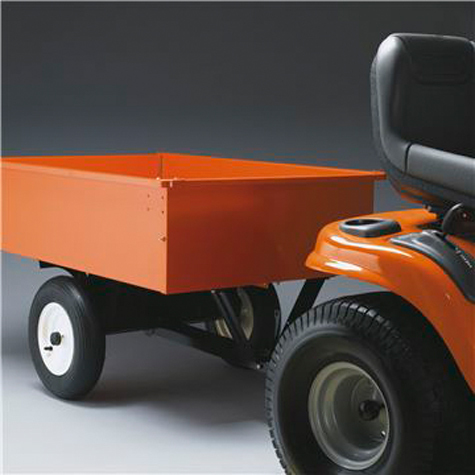 Attach a trailer, spreader or a snow blade and complete any tasks with minimum effort. You can expect more from our top-segment tractors featuring U-Cut™ steering technology. Less uncut areas, extra efficient mowing and improved manoeuvrability. 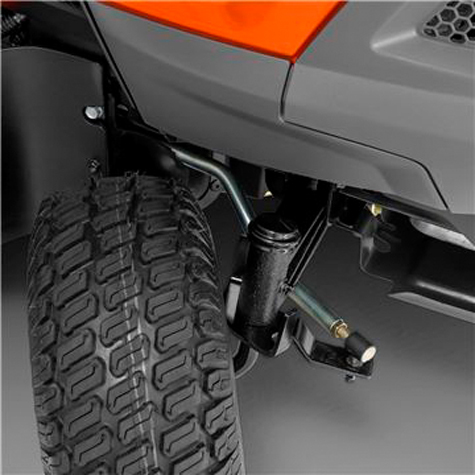 The pedal-operated hydrostatic transmission ensures easy speed and direction control. Separate pedals for both forward and reverse. The reinforced and powder-coated cutting decks give improved durability and corrosion resistance. 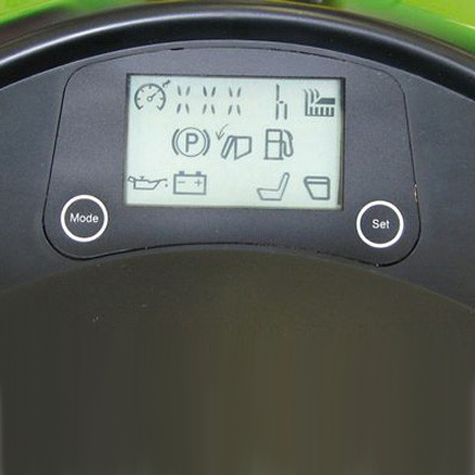 Change from collecting to mulching mode with a lever on the dashboard, without leaving your driving seat. The blade rotation is engaged and disengaged by an electric switch. The RapidReplace™ cutting blades are easily removed and replaced without tools. And with sharper blades, you’ll get a healthier lusher lawn. 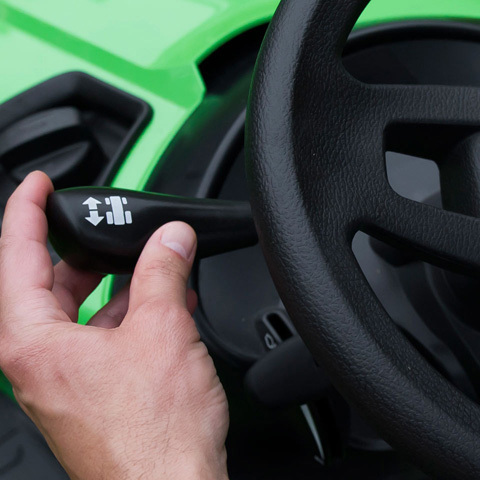 The SmartSwitch™ panel enables keyless starting and a visual control system, so you don’t have to look for lost keys when you need them. 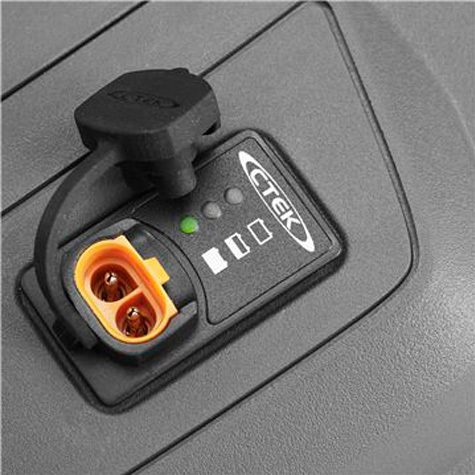 The dashboard-mounted battery indicator with charger connection makes battery status check and recharging of the battery very convenient. 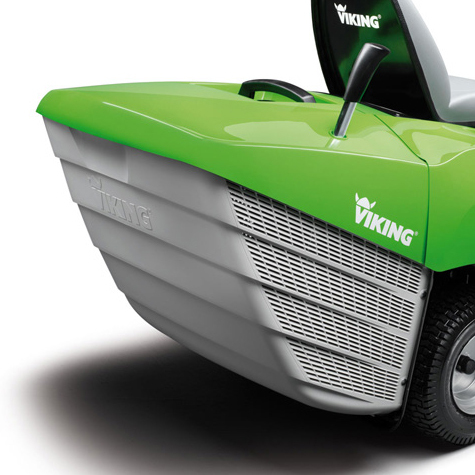 Viking ride-on mowers offer the right cutting width and mowing performance for large gardens. 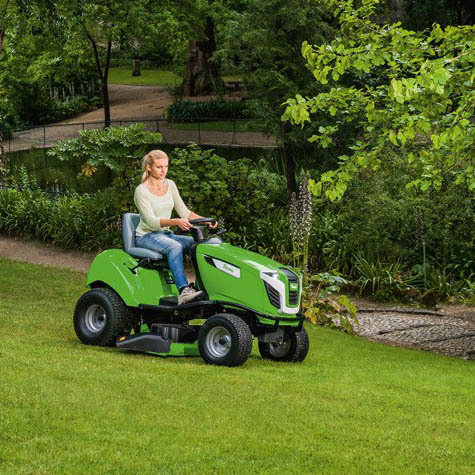 The compact and manoeuvrable R4 Series ride-on mower is ideal for lawns up to approx. 4,000m². The T5 Series and the T4 Series side-discharge tractors are recommended for lawns up to approx. 8,000m² and the T6 Series can cover as much as 10,000m². If your lawn has several bushes and trees and if the space between beds is tight, we recommend our streamline R4 Series ride-on mowers. The side discharge T4 tractors are extremely manoeuvrable as there is no grass catcher box. Extensive lawns where speed, maximum cutting performance and ride comfort are required will be more suited to the T5 and T6 Series lawn tractors. 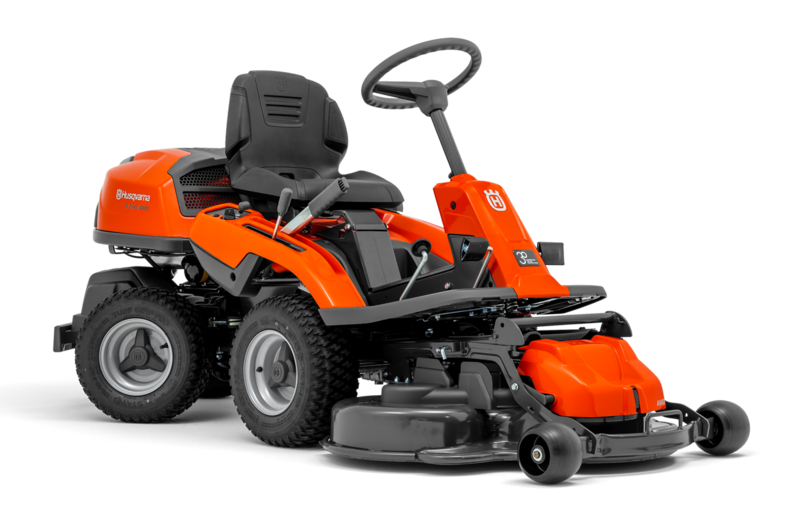 All mowers feature single-pedal self-propulsion, forward and reverse drive switching, hydrostatic drive and electromagnetic mowing deck activation. Mowers with efficient 2-cylinder engines are even more powerful. Comfort and versatility characterise Viking's innovative rideable mowers – the lawn tractors and ride-on mowers are ideal partners when it comes to large lawns. 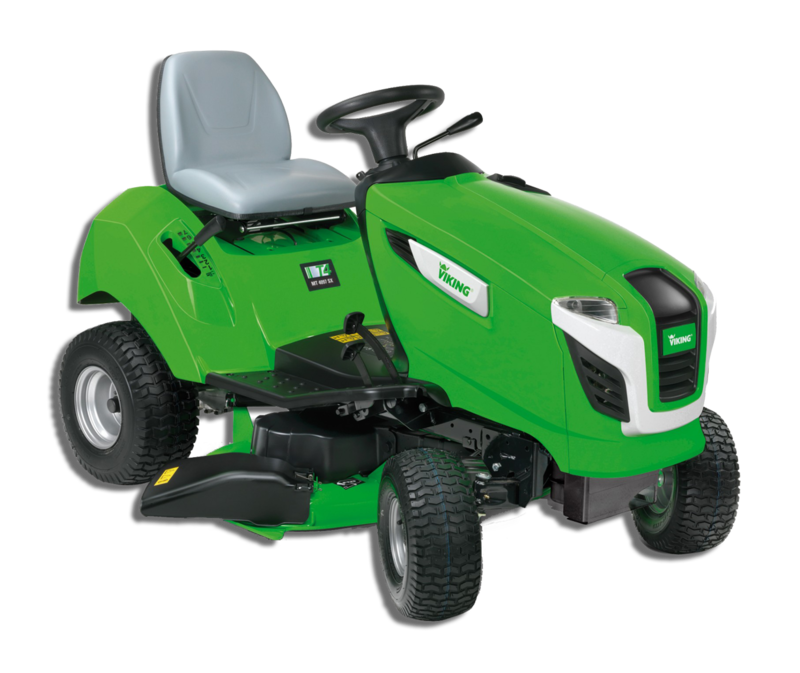 Their high mowing performance is complemented by simple operation, outstanding driving characteristics and a comprehensive accessory range. 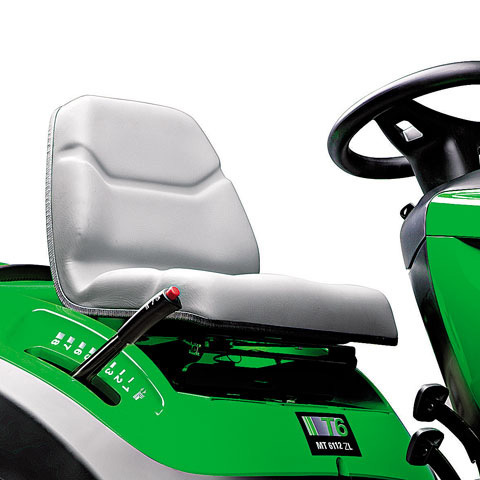 Viking lawn tractors combine reliable quality and excellent innovative technology. This is demonstrated by excellent cutting performance and superior handling, ensuring a fun comfortable drive with easy operation. Our T6 tractors feature a new hood and deck design all aimed at further improving performance and ergonomics. Some further features are below, these vary from model to model. 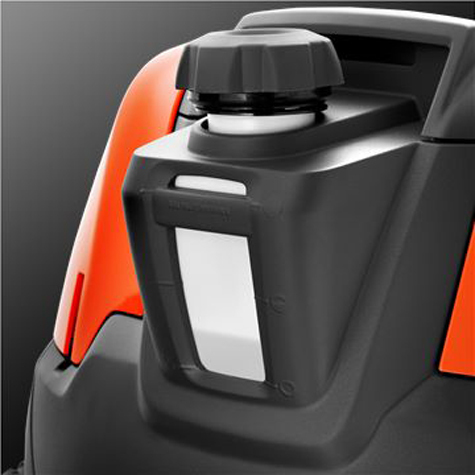 The grass catcher box can be easier emptied effortlessly from the driver's seat using the hand level. It couldn't be more simple to change direction by using the hand lever which is used to comfrtably switch between forward & reverse gears. Perfect seating postion for almost every user height. The seat can be quickly & easier adjusted & without the use of any tools. The extremely small turning circle is ideal for gardens with many trees and obstacles. Time saving mowing with side discharge with no grass catcher box to empty. Large areas can be completed in a single, simple operation. The 2 blade system with angled blades provides a neat & clean cutting pattern. Displays functions including operating hours, battery voltage, fuel level, cruise control & more. 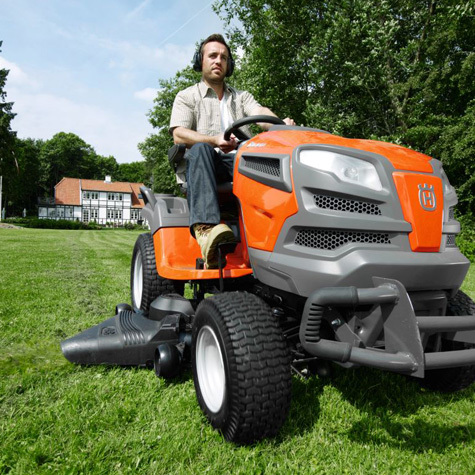 We understand that purchasing a sit-on lawn mower is a financial commitment, so it is essential to get the correct one. 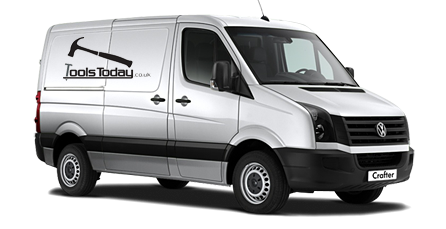 We assemble, PDI (pre delivery inspection) & deliver all sit-on lawn mowers on our own vans. Once delivered we will run through all the features & benefits of your new sit-on lawn mower answering any questions you may have. Please feel free to contact us to discuss your requirements or if you have any questions regarding our sit-on lawn mower range.